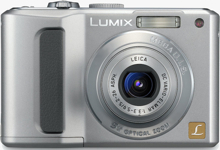 The Panasonic Lumix LZ8 (announced 29 January 2008) is an 8.1 megapixel digital camera with a 5x optical zoom lens (32mm – 160mm equivalent). It features a 2.5 inch LCD, 20 megabytes of internal memory, face detection technology and ISO of 100 to 1600 (extendable further). The Panasonic Lumix LZ8 also features Intelligent Auto Mode, consisting of the following features: MEGA O.I.S, Intelligent ISO, Intelligent Scene Selector and Quick AF (auto focus).